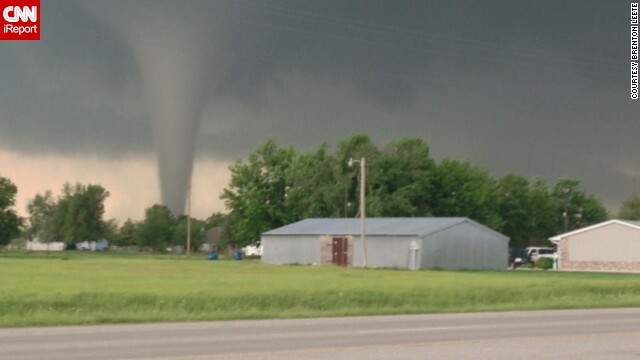 CNN iReporter Brenton Leete took this photo of the tornado on the ground in Moore, Oklahoma, on Monday. Yes, climate change is happening. But it's hard to say that the tornado that ripped through Moore, Oklahoma - or any given tornado, for that matter - was influenced by climate change. Scientific research has not made a clear connection between tornadoes and climate change, said J. Marshall Shepherd, climate change expert and professor at the University of Georgia. There is currently a much better understanding of how climate change increases the risks of droughts, heat waves and precipitation, he said. There are also indications that changing patterns may influence the intensity of hurricanes. But as far as tornadoes: There's just not a lot of information. i always frequent health stores because i always need to buy food supplemments to keep my body healthy.`.."
Hard to believe that someone is getting paid to write this trash. As a Okie I can tell you we have them every spring always do always will and global warming has not one thing to di with it. What is really sad is a writer would use such a tragic storm to push their political trash onto the public. It IS causing by Global Warming ! There! It has been said! Period! Oh, come on! Don't tell us it's hard to say that the tornado was influenced by the climate change. In the silence people could hear the clock ticking and watchmakers would not fail to understand it working together with the systems. I mean when we see a variety of the presences of the climate, we should not miss them which are actually working together with the variable systems.